Archbishop Thomas Wenski tries on his new "Adelante"-branded motorcycle helmet after celebrating an all-school Mass Aug. 30 to mark the start of the 60th school year at the Marist Brothers' Christopher Columbus High School in Miami. Looking on, from left: Deacon James Dugard, Columbus theology teacher, and Father Richard Vigoa, the archbishop's master of ceremonies. 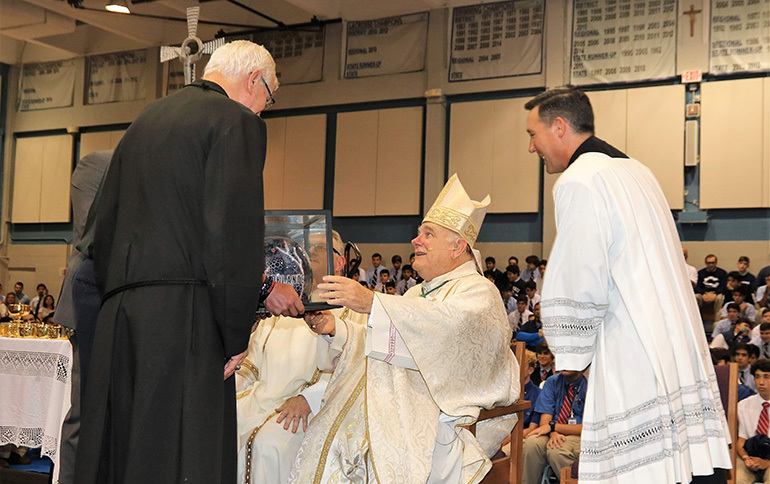 MIAMI | The 2018/19 school year marks Christopher Columbus High School’s 60th anniversary, and the school kicked off the celebration with a school-wide Mass Aug. 30 celebrated by Archbishop Thomas Wenski (see homily). Among those in attendance was Father Alejandro Rodriguez Artola, an alumnus who is now pastor of St. Thomas the Apostle Church in Miami. 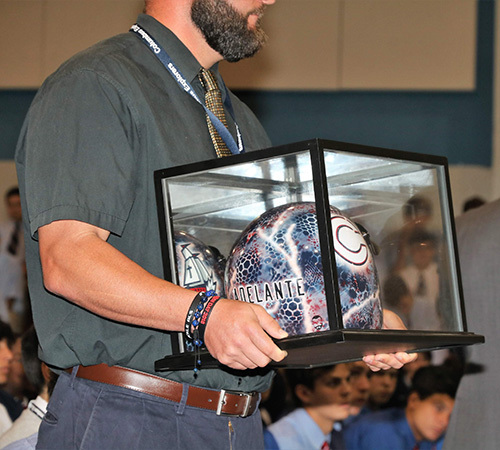 This motorcycle helmet bearing Christopher Columbus High School's "Adelante" motto was presented to Archbishop Thomas Wenski at the all-school Mass Aug. 30 marking the start of the 60th school year at the Marist Brothers' school in Miami. At the end of the Mass, Marist Brother Kevin Handibode, Columbus president, presented Archbishop Wenski, a motorcycle-riding enthusiast, with a Columbus branded motorcycle helmet, hand-crafted by alumnus Marcus Rivero ’02. The archbishop tried it on amid a roar of cheers and applause from the students. An all-boys school, Columbus first opened its doors in September 1958 with an enrollment of 139 students. Today, enrollment stands at over 1,700. The first class graduated in 1959 and that September the Marist Brothers assumed the direction of the school. Since then, Columbus has fostered three traditions: the pursuit of academic excellence, the heritage of Catholic education, and the unique spirit and mission of the Marist Brothers. The school is planning other special events for its anniversary year, including a 60th Anniversary Gala at the JW Marriott Marquis on March 23, 2019 which will count on attendance from alumni from the past six decades and present and past faculty members. Also, there will be a closing year Mass at the school celebrated by several priests who are Columbus alumni. “What better way to kick-off and close our 60th anniversary year than in communion with Jesus Christ, thanking our Lord for the blessing that is Columbus, through the intercession of Mary our good Mother,” Brother Kevin said. Marist Brother Kevin Handibode, president of Christopher Columbus High School, presents Archbishop Thomas Wenski with an "Adelante"-branded motorcycle helmet after the all-school Mass Aug. 30 to mark the start of the 60th school year at the Miami school. Looking on, right, is Father Richard Vigoa, the archbishop's master of ceremonies.